With instances of Carpal Tunnel Syndrome and other problems caused by poor office habits on the rise, more and more people are displaying a concern for abiding by proper office ergonomics. Changing your office habits for the better can have a number of health benefits, including reduced eye strain, back pain, wrist injury, and neck pain, among others. Below you will find the top four tips for improving your office ergonomics. When work and home life are both taken into account, the average office worker sits for upwards of fifteen hours a day, so one of the most important pieces of advice on improving your office health is to change positions often. Not only does this lessen the amount of strain placed on certain muscles and reduce the risk of overuse, but it also “restarts” the body. After an hour or more of inactivity, your body drastically slows the production of certain important enzymes, but by moving periodically, you prevent the production of these enzymes from ceasing. By doing so, you stand to lower your risk of weight gain, diabetes, and an unhealthy level of HDL (“good” cholesterol). Even regular exercise after work is not enough to offset the damage done by long periods of inactivity, so it is important to change positions, stand up, or take a short walk around the office at least once every hour. The most often repeated tip about positioning your computer monitor ergonomically is that it should be between 18 and 24 inches from your face. In actuality, however, it’s best for your screen to be as far away as possible while still being comfortably visible. Another misconception about computer screen positioning involves the monitor’s height. Previously, experts recommended that the top of the monitor be at eye level, but this is actually the HIGHEST height your screen should be. Your monitor should be positioned at the height that feels most comfortable for your eyes and neck, with the top of your screen being no higher than eye level. They keyboard is probably the most common offender of office ergonomics. When typing, your wrists should remain straight, and your forearms should be roughly parallel with the floor. There is nothing wrong with pushing your keyboard further towards the back of your desk, as long as your workspace is at a height that allows your wrists and forearms to remain in the proper position. Also, although wrist rests could be helpful for some individuals, experts now believe that they should not be used constantly. The carpal tunnel is located on the underside of the wrist beneath the palm, and, by using a wrist rest too frequently, you could be subjecting the carpal tunnel to dangerous amounts of unnecessary pressure. Although it is common for ergonomics articles to recommend a certain posture, in actuality, there is no single “right” way to sit. An upright posture with your hips at a ninety degree angle was once the most common recommendation, but this is actually no longer preferred. Instead, experts now advise office workers to strive for a seated position in which the angle of their hips (the angle between their torso and thighs) is greater than ninety degrees, around one hundred thirty degrees. 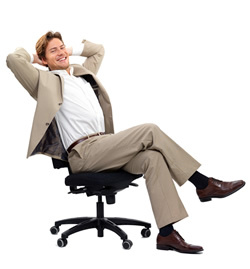 Although, as noted above, switching positions is very important, this wide angle position is very ergonomic because it alleviates stress on your lower inter vertebral disks and also requires your back muscles to work less hard, as some of your body weight is now supported by your chair. If you are concerned about having a faulty office setup, we recommend swinging by the website of Daniel Baumstark, one of Washington, D.C.’s top physical therapists, and taking advantage of his affordable online office ergonomic evaluation. From my experience, changing postures and taking regular breaks improves just about everything. I personally own an Aeron (top class ergonomic chair with a hefty price tag), BUT it still doesn’t solve all my problems – I need to take regular breaks to get the blood flowing. I use Pomodoro technique to guide me as well – taking regular breaks when my app tells me to do them is far easier…maybe it will help you as well.